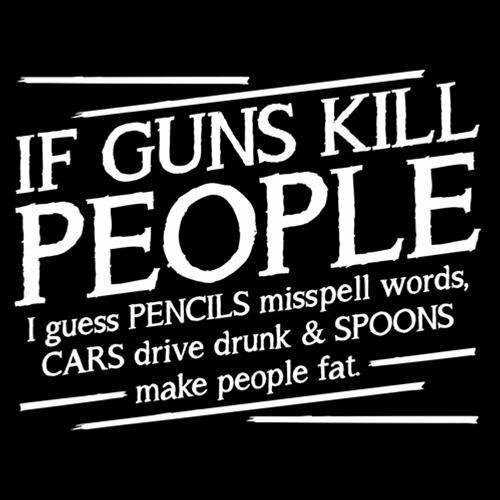 NO, GUNS ACTUALLY DO KILL PEOPLE! A few years ago a pastor friend of mine in the American Mid-West had to conduct a very sad funeral for a 7 year old girl. It was one of those really tough ones, as one of life’s most painful and unfortunate experiences is to lose a child. The anguish in the heart of the young parents is unimaginable, except by maybe those who have lived through this kind of tragedy themselves. The circumstances surrounding the death of this precocious little grade one student made it even more unbearable. Friday evening after work her father came home to find his two daughters, age 7 and 10, playing in the back yard. He joined them for 20 minutes of frolicking in the snow until it was time to come in for dinner. Just inside the back door the father bent down to help his youngest daughter remove her boots. His legally obtained and loaded handgun fell out of his jacket pocket, hit the floor and accidentally discharged. It shot her in the head killing her instantly. The father was not law enforcement, requiring him to carry a gun, nor does the family live in a high crime neighbourhood where people think they need to carry a gun for protection. In fact much of the community is made up of Mennonites and Amish, not people normally known as violent offenders. My pastor friend told me that on any given Sunday there might be a dozen men ‘packing heat’ in the church service. He felt somehow comforted by that fact. I personally would be terrified given that it is usually me that offends people in church. One ill-conceived Mennonite joke in a sermon and I might have a dozen bullets flying my way. No thanks. None of these clever slogans will ever lessen the grief of the family of the 7 year old girl. And I know that many would unsympathetically squarely blame the father who carelessly and improperly carried his loaded handgun around in his pocket. But here is the point I am going to make in this post. The more guns that are out there, the more innocent people are going to die. Guns actually do kill people. 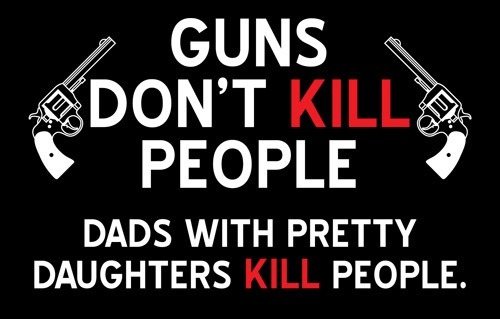 There is no doubt that if the father did not own a handgun, his daughter would still be alive. It is that simple. In the last few weeks we have seen some horrendous gun related tragedies south of the border. In June, a 29 year old Omar Mateen entered an Orlando night club killing 49 and wounding 53. He was armed with a Sig MCX semi automatic sub machine gun (that in the US you can by at Cabela’s) and a handgun. A few weeks later 25 year old Micah Xavier Johnson opened fire on a group of Dallas police officers killing 5 and wounding 9 others. He was armed with a Saiga AK-74 assault rifle and a handgun. After each of these incidences there was renewed talk about banning the sale of assault rifles to the public. Paradoxically, as the result of these announcements there were massive increases in sales of assault rifles at guns shops all across America. To be perfectly clear on one point, this type of weapon has only one intended use, killing people. They are almost useless for hunting or target practice but they do an excellent job of killing people. Absurdly, the American solution to the epidemic of gun violence seems to be – you guessed it, more guns. Many of them live with this false sense of security that in order to protect yourself against violent criminals the best defense is to carry a gun yourself. 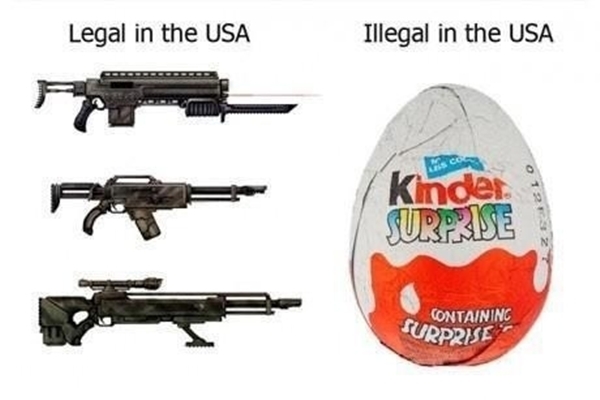 I have discussed this many times with my American friends and they just simply cannot seem to connect the dots that the more deadly weapons you have in circulation, the more people are going to die as a result. They have bought into the Second Amendment mentality that everybody needs a gun to defend themselves. The stupidity of this logic is, that if you did happen to encounter an armed career criminal, they are going to kill you long before you have the presence of mind to secure your weapon and shoot it at another human being. Something you are not even psychologically capable of doing. 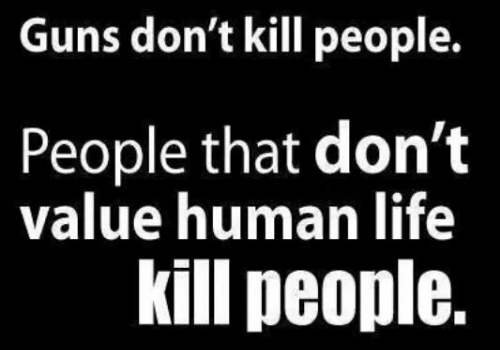 Killing is not normal human behaviour. (Soldiers in the first World War more often than not shot over the heads of their enemy because humans are naturally averse to killing. Today the military must use de-sensitivity training to ingrain the ability to use lethal force.) Today there are more guns in the US than there are people (Over 300 million at a per-capita rate of 112 guns/100 people). The sheer number of weapons in circulation creates an environment where criminal and imbalanced people have unlimited access to killing devices, which in of itself, creates a culture where people live under a continual threat of violence. In the interests of full disclosure, I am a gun owner. I have two shotguns and a .22 cal rifle. My guns were properly registered (no longer required), stored securely with trigger locks and the ammunition stored in a separate location where a thief would never be able to find. I do not bring my guns to church or carry them around in my pocket. They only see the light of day when they are used for their intended purpose. I am not prepared to get into a debate about animal rights here, so I am not going to say what I hunt. Although one Thanksgiving I decided to shoot my own turkey. It did not end well, the meat department manager at Safeway told me to leave and never come back. But seriously, I would have no trouble giving up my guns to help the cause. In fact I might. This culture of gun violence is now being imported around the world. Dr. Samantha Nutt is a Canadian humanitarian who is the founder of War Child Canada. She has spent most of her adult life working in war torn countries like Iraq, Afghanistan, Somalia, Congo, Sierra Leone and Darfur, Sudan. She has done an incredible TedTalk where she pointedly describes how the 5 permanent members of UN Security Council (China, France, Russia, the United Kingdom, and the United States) plus Germany produce 80% of the world’s weapons. Always in search for a new market and driven only by profit, they have been importing weapons to the developing world at such alarming volumes that, “In many places in which I have worked, it is easier to get access to an automatic rifle, than it is to get access to clean drinking water,” Nutt says. She also claims that an AK47 can be purchased for as little as $10. As a consequence anybody, including elementary school age children, have access to small arms. Some are being trained by militia groups to become ‘freedom fighters’ and have committed their first murder by 8 or 9 years old. 40 million people have died or been displaced in the Global South by the proliferation of small arms. Nutt’s indictment of the West is,“that most of the people who are dying in war are living in poor countries, and yet most of the people who are profiting from war are living in rich countries — people like you and me.” The madness needs to stop! I will say it again, guns actually do kill people. 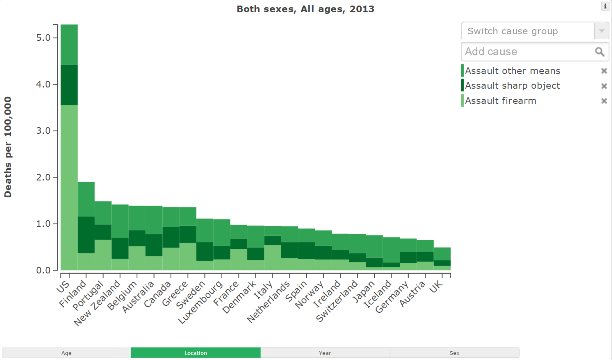 When you look around the world at places where gun ownership is low, gun violence is proportionately low. In England where even the police do not carry guns, gun violence is almost nonexistent. We have a promise that one day we will all live in a peaceful world where there is no more war, no more violence, no more killing… and no more weapons. He shall judge between the nations, And rebuke many people; They shall beat their swords into plowshares, And their spears into pruning hooks; Nation shall not lift up sword against nation, Neither shall they learn war anymore. (Isaiah 2:4) That day cannot come too soon because the world has gone completely gun crazy mad. ADDENDUM: After reading the comments on this post for the past few days I think I may have been slightly misunderstood as to what I was saying. 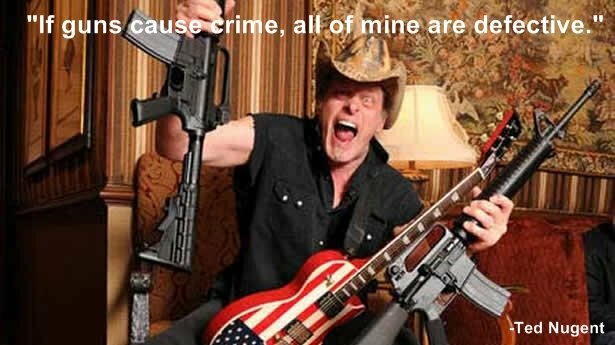 I am not advocating the outlawing of guns. As I mentioned I have been a gun owner almost my entire life and passed the hunter safety course when I was 12 years old. I have no problem with farmers, ranchers, hunters, and target shooters owning guns. I am trying to expose the fallacy that owning guns for protection makes people safer. It does exactly the opposite by accommodating an ever increasing mindset that violence is viable option in personal crisis. . The arms manufacturers are not unlike the tobacco industry and are committed to putting a gun in the hand of every man, woman and child. They are driven to profit off the misfortune and deaths of others. The wholesale arming of unstable war torn parts of the world has to be immoral on some level. 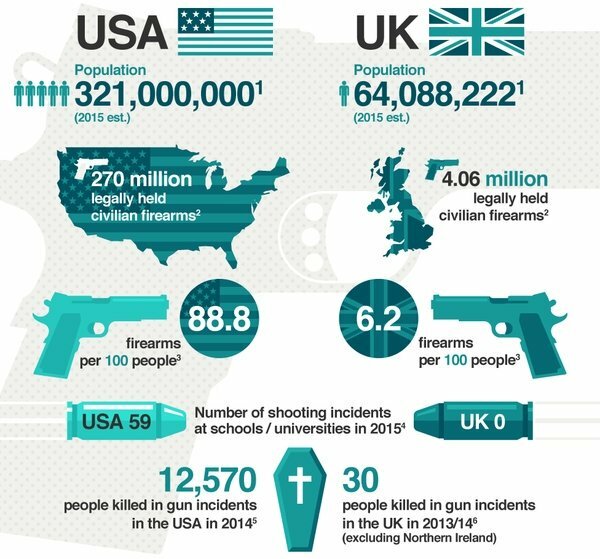 Canada and Great Britain are empirically much safer countries than America and Sudan because we do not readily sell handguns and assault weapons to the general public. The gun murder rate in the US is 25 times higher than that of other developed countries. 91 people are killed everyday in the US by guns. Seven of them are children. I think we are being deceived by the gun lobby when we buy into the logic that it is somehow our civic right to own an assault rifle or handgun for protection. There are just too many nutcases out there. We should be alarmed and concerned about the epidemic of gun violence in our world today. Jesus clearly rebuked the use of weaponry against our fellow man. “Then Jesus said to him, “put your sword back into its place; for all who take the sword will perish by the sword.” (Matt 26:52) Conversely Jesus advocated only non-violence. He told His follows to ‘turn the other cheek’, to ‘love their enemy’ and “to do good to those who hate you”. Never once does he recommend killing someone, even in self defense. Luke 22:36 is the only place where Jesus suggests it is OK to use lethal force but that is only if read out of context. Here is what its says, Luke 22:35-38, [Jesus] asked them “When I sent you out without a purse, bag or sandals, did you lack anything?” They said, “No, not a thing.” He said to them, “But now the one who has a purse must take it, and likewise a bag. And the one who has no sword must sell his cloak and buy one. For I tell you, this scripture must be fulfilled in me: ‘And he was numbered among the lawless’; and indeed what is written about me is being fulfilled.” They said, “See, Lord, here are two swords.” “It is enough,” He replied. Enough for what? Not for defending themselves against the Romans, But enough to be considered a band of criminals thus fulfilling the prophecy that He was numbered among the lawless. So shortly after this when the Romans show up Peter cuts off one of their ears. Jesus tells him to put the sword away claiming that to live by the sword is to die by the sword. Then is it immoral to use a weapon in warfare, or police work etc? Not at all… but your chances of dying by a like weapon is so much greater. After years of studying the Word of God I have become convinced that the message of Jesus is always one of forgiveness and non-violence. I believe it is far more christian-like to die for our faith… than to kill for it.